Eltronicschool. - This is one of the changeover switch circuit automatically for you who want to make the automatic switchover of a load between a battery and a wall adapter. In this time, based on LTC4412 IC, we will give you one of electronic circuit schematic of An Automatic Changeover Switch using IC LTC4412 like in Figure 1. below. Beside the circuit, here we also will give you description about this circuit. Circuit schematic like in Figure 1 above is An Automatic Changeover Switch using IC LTC4412. 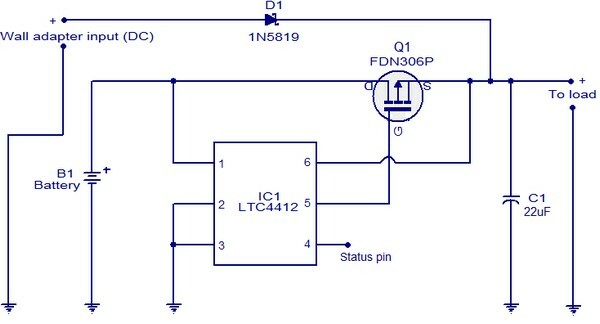 According Circuitstoday site describe LTC4412 controls an external P-channel MOSFET to create a near ideal diode function for power switch over and load sharing. This makes the LT4412 an ideal replacement for power supply ORing diodes. A wide range of MOSFETs can be driven using the IC and this gives much flexibility in terms of load current. The LT4412 also has a bunch of good features like reverse battery protection, manual control input, MOSFET gate protection clamp etc.